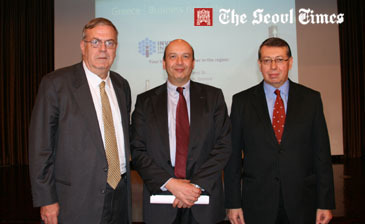 Greek Ambassador to Seoul Petros Avgerinos (left) poses with Mr. Apostolos Tsoukalas (right), CEO of Invest in Greece Agency, and Mr. Nikos Stamou, an investment promotion officer of the agency. at an investment seminar held at the Westin Chosun Hotel in downtown Seoul on Nov. 5, 2009. Greek Ambassador to Seoul Petros Avgerinos has recently hosted an investment seminar at the Westin Chosun Hotel in downtown Seoul in his efforts to draw investment from South Korean industries and businesses. A number of people from nearly all walks of life as well as from business circles were invited to the seminar held on Nov. 5, 2009 at the hotel. Mr. Apostolos Tsoukalas, CEO of Invest in Greece Agency and Mr. Nikos Stamou, an investment promotion officer, were invited to speek at the seminar. Mr. Tsoukalas delivered a speech on "Invest in Greece's Stragegic Location" following an welcoming remark by the Greek enovy. Greek Ambassador to Seoul Petros Avgerinos (right) poses with Mr. Apostolos Tsoukalas (2nd from left), CEO of Invest in Greece Agency, and Miss Ko Ah-Ra (2nd from left), MECEN IPC Co.'s Overseas Project Team, at an investment seminar held at the Westin Chosun Hotel in downtown Seoul on Nov. 5, 2009. Mr. Stamou also made a speech on "Technology and Energy: Growth Opportunities in Greece." A session of questions and answers followed the speeches. During the seminar a varity of Greek economic situations were introduced to the audience. The comparisons in the economies of South Korea and Greece were also debated during the seminar. A cocktail reception was held after the seminar. For details or inquiries please contact Ms. Marina Tzin-Chi Li of the Office of Economic & Commercial Affairs of Greek Embassy in Seoul at 754-8292.